The gradient hues of trees on the mountainside, the satisfying crunch of leaves on a sidewalk and the crisp breeze in the air signal the autumn season. With empty candy wrappers piling up in trash cans, the Halloween season is officially over for 2016, yet there is still a month and a half of autumn left to savor. "After Halloween, the next holiday people usually think about is Christmas. When people think about Christmas, they think about wintertime,” said junior Anna Trixia Segovia. In the interim between Halloween and the official start of the winter season, there are a number of timely activities ideal for autumn that serve as distractions from the overwhelming loads of schoolwork. The number of activities hosted by local farms is typically underestimated. However, these farms function as the perfect venue for an afternoon of seasonal recreation. Surrounded by an abundance of natural beauty, Ramapo College is in close proximity to some of the most popular farms in the area, including Secor Farms in Mahwah, N.J. and Demarest Farms in Hillsdale, N.J. 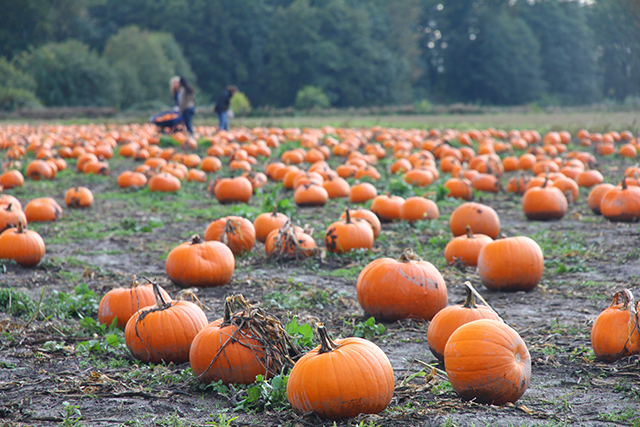 These farms offer a wide range of activities, including apple picking, vast pumpkin patches, hayrides and winding corn mazes. Animal lovers will jump at the chance to feed animals at Secor Farms’ petting zoo. Of course, a trip to a local farm would be incomplete without a few sips of fresh-pressed apple cider and one, or maybe two, cider doughnuts. Coming back from the local farm with a bucket of apples, a few pumpkins and a bag full of vegetables like squash and sweet potatoes is a recipe that calls for donning on an apron and a chef’s hat. As a byproduct of the change in climate, different sets of fruits and vegetables reach their peak during each season, which opens up an opportunity to add a twist to that time-honored family recipe or test out a completely new recipe. Besides producing the mouthwatering taste of a freshly baked apple pie or creamy pumpkin soup, seasonal ingredients are also cheaper, more environmentally friendly and have a higher nutritional value, fueling the body with the right nutrients and vitamins. “If you’re picking the food, you know where it comes from rather than just buying it in the supermarket or just getting the dish already made. It’s pretty cool to see where your food comes from,” said senior Brittany Jordan. Submerged in term papers and midterm exams, it is all too easy to forget to pause for a moment and take a look around. The autumn season beckons students to lift their eyes off of their textbooks and laptops to appreciate the natural beauty around them. “In my fall semester of my freshman year, I would go hiking around this time. It was very relaxing because I was very stressed out,” said Sena. Nature gets a makeover this time of year with the leaves changing colors. The best ticket to the show would be aboard a hot air balloon soaring thousands of feet in the air, where the aerial view of the treetops is absolutely breathtaking. For those with a fear of heights, nature can easily be admired on a hike through the Ramapo Reservation. As the days continue to be crossed off on the calendar, the fall season is nearing its close and winter jackets are about to make an appearance. There is just enough time to take advantage of the cool weather, throw on a light jacket and make memories with friends and families, bonding over these seasonal activities.